Although WordPress.com is a free service, it offers enhancements for a fee. WordPress.com calls these items upgrades, and you can purchase the upgrades from within your WordPress.com Dashboard. Click the Store link on the Dashboard navigation menu to display the Store page. Add a Domain: This upgrade allows you to add your own domain name to your WordPress.com account. This service costs $5 for the domain registration and $13 for the domain mapping. VideoPress: This upgrade allows you to upload, store, and share your videos from your WordPress.com account. This service covers the storage space that your video files take up on the WordPress.com servers. It costs $60/year. Custom Design: This upgrade lets you customize the Cascading Style Sheets (CSS) and use Custom Fonts for the theme you’re currently using in the WordPress.com system. Recommended for users who understand the use of CSS, this upgrade costs $30/year. No Ads: For $30/year, you can ensure that your WordPress.com blog is ad-free. Occasionally, WordPress.com does serve ads on your blog pages to try to defray the costs of running a popular service. If you’d rather not have those ads appearing on your blog, pay for the No Ads upgrade and you’ll be ad-free! Site Redirect: You can pay WordPress.com to add a forwarder on your WordPress.com blog address if you change blog addresses or domain name. The forwarder automatically forwards your visitor’s browser to your new domain name, or blog address, seamlessly. The cost is $13/year. Premium Themes: You can get many of the themes available on WordPress.com for free — but if you purchase the Premium theme upgrade for a one-time fee of $20, you get access to the premium theme of your choice to use on your blog forever. You can also purchase access to Unlimited Premium themes for $120/year. WordPress.com Business: This hosting upgrade for $299/year is considered by WordPress.com to be its Pro-level service. It offers access to any of the themes (including premium) at no additional cost, and allows you to upload all the video and audio files you want with unlimited storage. It also offers access to premium support through live chat channels with WordPress.com specialists during regular business hours (M-F, 9-5pm EST). WordPress.com Enterprise: Upgrade to this package for $500/month and have access to a website with custom branding, reliable hosting, bulletproof security, and more than 100 plugins available for your use (plugins that are unavailable for free or Business users of the WordPress.com service). Guided Transfer: Sometimes WordPress.com users transfer their site to their own hosting account using the (self-hosted) WordPress.org software, which provides them with a great deal more control and flexibility. If transferring your WordPress.com account is something you’d rather not do yourself, you can hire WordPress.com to do it for you for a one-time fee of $129. 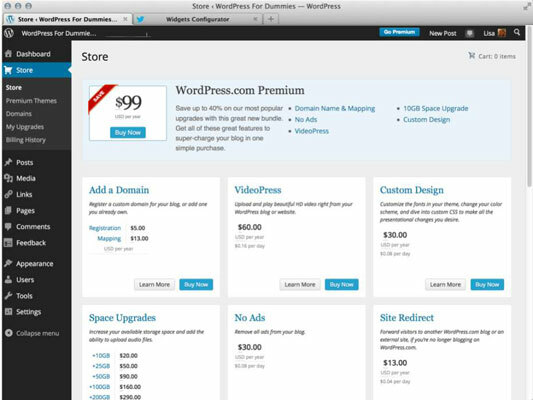 WordPress makes several of its premium features available in one convenient bundle called the WordPress.com Premium. For $99/year, you can upgrade your WordPress account to include the following premium features: one domain name of your choice or domain mapping for a domain that you already own, VideoPress, Custom Design, 10GB space upgrade, and the No Ads option for your WordPress account. This bundle provides you with some of the more popular upgrade features that WordPress has available and is an easy way to take advantage of some savings to include these premium features on your account.